Even the most confident person can trip up when it comes to having a conversation with somebody new. If you have had feelings for a guy for a long time, it can feel forced or awkward when you attempt to take the conversation to the next level. If this guy is new in your life, it can be just as hard to steer the conversation somewhere romantic. Dating is hard and conversation is a very large part of dating. Here are some great tips on how to start a conversation with a guy in your life. Are you crushing on a co-worker? Hey, it happens to the best of us. There is nothing wrong with liking a co-worker as long as it won’t get you into trouble with your company. It is natural to have feelings for someone who you, assumedly, spend a lot of time around. 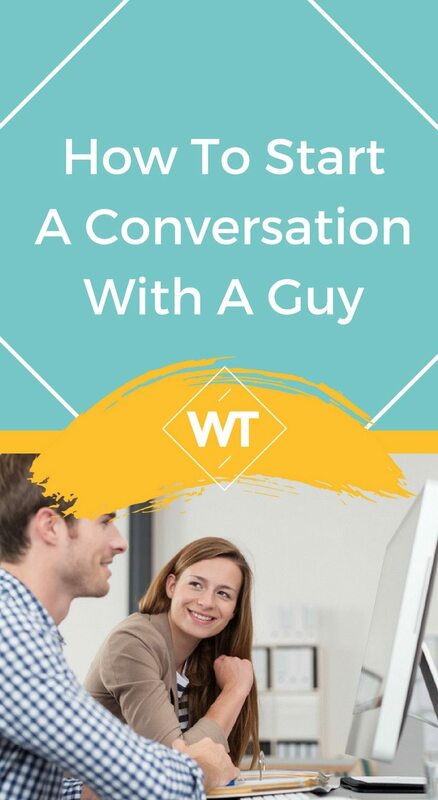 But how to start a conversation with a guy at work is another story. The most obvious answer would be to discuss work, which is not a bad approach. Talking about work is natural since, well, you are both at work. 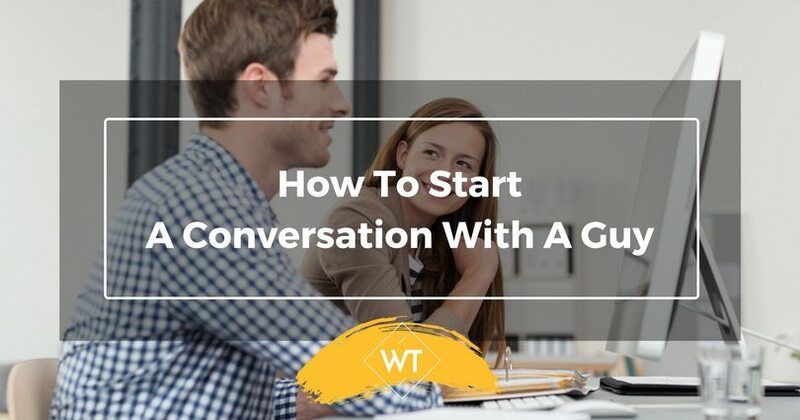 Eventually, you will want to move the conversation away from the topic of business, but there is nothing wrong with striking up a conversation at the water cooler. Start with something simple like, “How was your presentation for Mr. Harvey?” (Or something similar in your own profession.) If you two have chemistry, the conversation will naturally flow into other territories. Does your town have a weekly or monthly art walk? Art walks, or other community events, offer great opportunities to meet new people. If there is a guy you have your eye on—either someone who works for a shop on the art walk or someone who frequents community events—why not approach him about your mutual interests? You already know that the two of you care enough about your community to be out and about. Take the angle of discussing a piece of art you are both admiring, or something in a shop, or even the free wine they are handing out. He will remember your creative approach and he will appreciate your community involvement. Coffee shops are classic meet-cutes in movies and television, and why shouldn’t they be? Most of us have spent at least some time in a coffee shop, either reading, catching up with friends, or studying for a big test. Coffee shops attract a lot of different types of people, furthering your chance of meeting someone new. If you have your sights set on somebody, ask for permission to sit at his table. It is as simple as that. First of all, it is polite to ask before you encroach on someone’s space. Secondly, if he is potentially interested in you, he might seize the opportunity to ask you about what you are reading or working on. Don’t force conversation too aggressively in a coffee shop. Many people are there to work and not to socialize, which is why opening with the “Do you mind…?” question is the best approach. At a mutual friend’s party, there are plenty of opportunities for someone to catch your eye, but how do you strike up a conversation? Parties are arguably the easiest social situation to chat with your new crush. There are endless subjects to tackle at a party. Maybe you two are on a team for a game at the party, or maybe you can muster up the courage to be bold enough to ask him to be. These questions, though relatively simple, are great entries for a deeper conversation. A bit of flirtation in your tone will let him know that you are interested in more than the location of cookies at a party. Bookstores are fantastic for many reasons. Being immersed in a world of fantastic characters and escapes from reality gives us all a magical feeling. If you happen upon a guy you are interested in while at a bookstore, rely on that aforementioned magical feeling to seize the opportunity to talk to him. Your conversation will flow effortlessly when discussing subject matters you both are passionate about. If nothing else, maybe you will get a few good book recommendations! There are plenty of answers to how to start a conversation with a guy who has captured your attention. The most important thing to remember is to stick to appropriate topics based on your location (work, a bar, a coffee shop) and to act with confidence! Any guy will be lucky to have you talk to him. Make your words count!